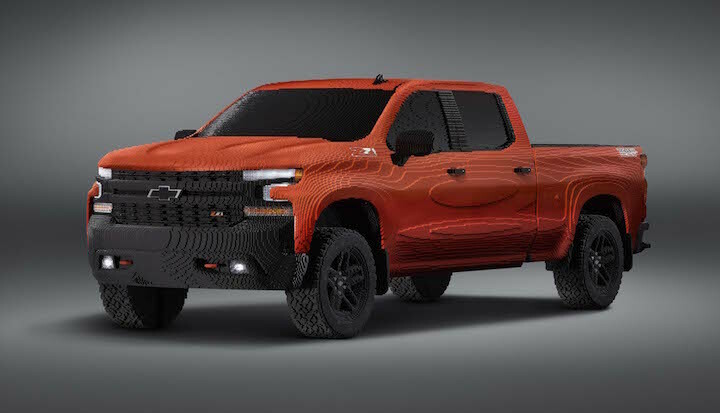 General Motors has partnered with Warner Bros. Pictures and LEGO to build a life-size 2019 Chevrolet Silverado 1500 Trail Boss entirely out of LEGO bricks. The massive sculpture, which is the first full-size Chevrolet to be constructed from the popular plastic building blocks, was put together by eighteen specially trained LEGO ‘Master Builders’ who spent more than 2,000 combined hours selecting and placing the 334,544 pieces on the truck. The truck is made mostly of red, white, black and grey LEGO bricks, but also includes clear bricks for the working headlights, along with amber-tinted bricks for the indicators. This undertaking, which is also intended to promote ‘The LEGO Movie 2: The Second Part’, continues the partnership between Chevy and Warner Bros. Pictures that began a couple of years back with ‘The LEGO Batman Movie’ and the life-size Chevrolet branded LEGO Batmobile that debuted at NAIAS 2017. In addition to the full-size LEGO Silverado Trail Boss, the new partnership will also a miniature LEGO Silverado High Country make an appearance in ‘The LEGO Movie 2: The Second Part’ film when it debuts in theaters on February 8th. This stunt is yet another prong in Chevy’s new marketing campaign for the new Silverado, which includes numerous new ad sports for TV and digital along with branded magazine covers, branded Amazon delivery boxes and much more. You can see the 3,307 lb LEGO Chevrolet Silverado 1500 Trail Boss on display at NAIAS 2019 from January 19th through to January 27th. Previous story Poll: How Do You Feel About Buick As A Crossover Brand? There are not enough room in this box to describe how much and what about the truck I like! If you buy a truck based on what a magazine or what consumer reports says. They you are foolish! It killed the good looks of the K2 1500s, didn’t bring any new power features to the table, powertrain and appearance options are tied into trim level, no more single cab short bed. That doesn’t sound “great” to me.